In a state that’s often divided along political, religious, cultural and even collegiate loyalty lines, there are few things that unite us as consistently as the NBA’s Utah Jazz. And fittingly—just as the resignation of longtime coach Jerry Sloan and the trade of star point guard Deron Williams were national sports headlines—Blonde Grizzly launched a group show focused around the team. 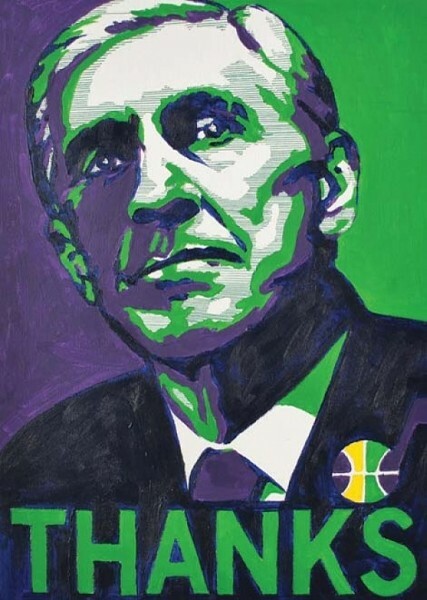 More than 20 local artists—including Trent Call, Sri Whipple, David Habben, Dan Christofferson, Kat Martin and Dave Lawrenc (his work is pictured) participated in creating works inspired by the Jazz, its players and, yes, Jerry Sloan. Sometimes heroic, sometimes satirical, they look at the joy and silliness of investing emotional energy in millionaires playing with a ball. And if you want to take home the show’s vibe, consider one of the limited-edition cotton T-shirts adorned with Sloan’s image. It’s all fun and games until someone turns it into art.